Last Thursday at Oiselle we had our first bride come in for a fitting! Sadly, Sally was already en route to Alabama with the Oiselle junior team for Nationals. But I got to be here at Oiselle headquarters for all the fun. You may have seen our Runaway Bride dress in Runner's World, or the various blogs it's been featured in. Race day weddings are the ultimated destination wedding for running couples. They pause at a point during the race, exchange vows and complete the race as husband and wife. Often the wedding is during a marathon, and of course the Vegas races see the highest number of running weddings. Sally noticed that while the popularity of weddings on the run was rising, there were no real options for brides. So the Runaway Bride dress was born. A stunning techinal wedding dress, that moves with you, wicks sweat, has a pocket for your ring and all the bells and whistles you need for a race AND a wedding. After the dress was featured in Runner's World we were contacted by bride to be, Kyla. She is getting married in April and as part of the wedding weekend she, her fiance and their guests will be running a group 5k the morning before the ceremony. Kyla met her future husband during a group run in their town. They both describe it as love at first site, or first run. Running brought them together and is an important part of their life together. And what better way to celebrate that meeting and their passion for running (and each other) than with a 5k run/race?! We've been very excited to meet Kyla and create the dress of her dreams! She flew in from California and met with Carmen, our fabulous seamstress who created the Runaway Bride dress. Kyla was so much fun to work with. She lit up the office with her smile and excitement. Carmen brought a couple test dresses for Kyla to try on. We talked tulle, veils, cut and all the details that will make this dress perfect for Kyla's big day (well big day before the big day). 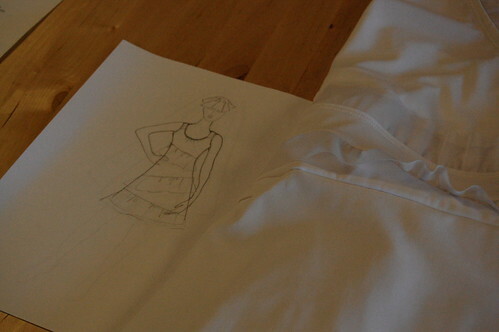 I'm not going to give away too many details, you'll just have to wait and see the final dress. It's going to be beautiful! To find out how to get your own running wedding dress visit Oiselle Bridal. Thanks so much for the post! I was supposed to be there for the fitting with Kyla, but her flight was delayed due to weather. C'est la vie! But I can tell from the photos that she will be a beautiful bride - in any kind of dress! Can't wait to see more pics when the big day rolls around in April.